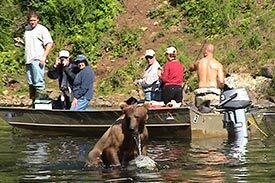 Visitors combine sport fishing and bear viewing. A crowded scene at the creek mouth. The Tule white-fronted goose nests in the area. Located on the west side of Cook Inlet, Wolverine Creek has become a popular fly-in sport fishing and bear-viewing destination. 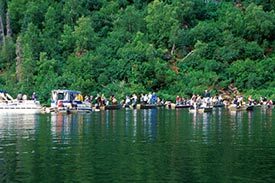 The experience is boat-based and the area can be crowded during peak season from mid-June to mid-July. Brown bears are abundant during mid- to late summer when the salmon are returning to spawn. They are frequently seen along intertidal drainages on the outer flats. Black bears are also abundant, but usually remain farther inland, in the mountains and foothills. The area also provides spring and fall resting and feeding habitat for hundreds of thousands of waterfowl headed to and from northern nesting grounds. During the summer it’s also an important waterfowl nesting area for ducks, geese, swans, and scores of other birds. 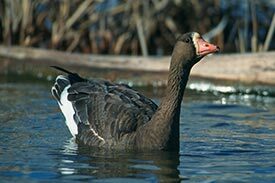 During spring, summer, and early fall, it supports the largest known concentration of tule white-fronted geese in the world. Most people book with a commercial bear viewing or sport fishing guide service in Kenai or Anchorage for a half-day or full-day trip. They land on the lake, transfer to small boats (generally skiffs of approx. 20’ and some covered pontoon party boats), and are motored into the cove to fish and/or watch bears fishing at the creek mouth. There is no shoreline access, other than a commercial lodge on a private inholding on the lake, which offers accommodations, meals, and guide services. Redoubt Bay is located approximately 40 miles southwest of Anchorage on the west side of Cook Inlet. The floatplane flight is about 50 minutes from Anchorage and 30 minutes from Soldotna.